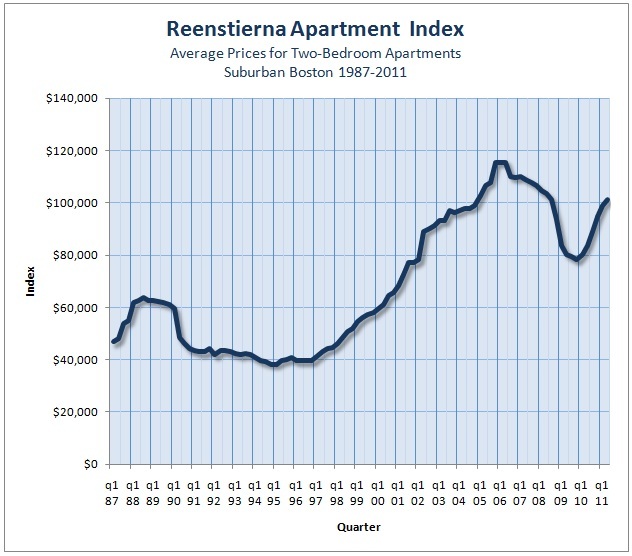 This issue of the Reenstierna Associates’ Report introduces the Reenstierna Apartment Index. 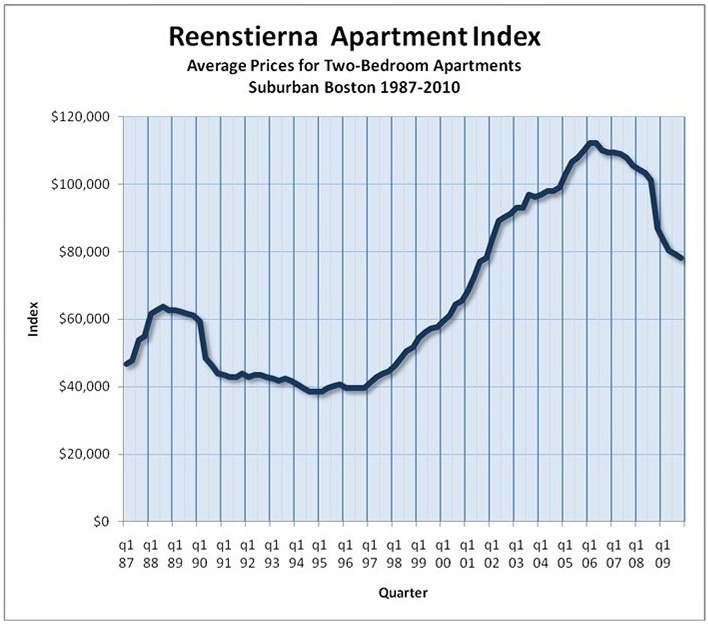 The index uses sale and resale data to track the average price of apartments in the Greater Boston suburban ring from 1987 to 2010. It is shown as a chart. The February, 2010 version of the chart is displayed here. Later versions may be found by way of the “Index” tab on the top bar of the Reenstierna Associates’ home page or by clicking on this link. A few words about what the chart shows are useful. The most striking features are the two price peaks that were reached in 1988 and in 2006. Each of these was preceded by a strong run-up – in the case of the 2006 peak, over a period of seven to eight years. Each was followed by a sharp, one-year decline. The chart confirms what we knew in a general way for fact. But it provides better detail. The 1989 decline reduced prices by about 35% from the 1988 peak. The 2008-2009 decline by early 2010 has reduced prices by 30%. If history is a guide to the future, we would say that, in 2010, a leveling of prices appears likely for a period of ten years, to be followed by a price run-up of seven years, a two-year peak, and another sharp decline. A few words are also useful about how the chart was created. The source of the data is sales and resales of individual buildings of four or more living units in the Greater Boston suburbs. Buildings of three or fewer units are excluded, because these are often partially owner-occupied. Owner-occupants have different motivations from those of rental income investors, and inclusion of small buildings could alter the graph. Buildings in urban locations (the Back Bay, Chelsea, Somerville, or Lawrence) are excluded. Some of these experienced an exaggerated price “bubble” and a subsequent price decline of not 30% but 50% in 2008. Others were affected by rent control and experienced a price surge when rent control was abolished in the mid-1990s; inclusion of these would produce abnormal readings. Buildings that experienced foreclosure during the sale-and-resale period are excluded. Foreclosure can be more than an economic event. It may be accompanied by abandonment of the building, freezing, and removal of pipes, systems, and kitchens, making the building very different at any post-foreclosure sale from what it was before. The process of data exclusion creates a chart that tells us something about apartment prices in largely middle-income suburbs. An equally valid chart could be created for lower-income cities. A different chart could be created for the market of three-families. A word of caution is in order. The suburban apartment chart may be an inaccurate source of price change information if applied to urban apartments or to three-families. The process of data exclusion also results in a diminished number of data points from which to derive the quarterly averages. Some years (1996-1999 or 2005-2007) show a high volume of sales and a relatively consistent picture, with small variation around the average. Others (1990-1992) show few data points. Still others (2001-2003) show a high volume of data points but greater variation. The data line presents the best match between the data points at any point in time. It is, however, somewhat over-simplified. The line might be thought of as the center line of a river. The center line of a river doesn’t entirely describe the river. A river can also be described by its banks. The “banks” of the river of data from which this line graph are derived at some points broaden to 10% or more on either side of the line. This office will produce regular updates of this graph, on a quarterly basis, as the market continues to produce new data.